Best Scooter Stocking Swag Evar. No fair! The UK always has the coolest swag. This is a stocking filler sold by Habitat (habitat.co.uk) though it doesn’t seem to be available through their website. It’s a brooch with a magnetic back, and when you activate it the three lights in the headlamp flash on and off incredibly fast. “Sheer class!” says Alice D. Thanks to her for this find. 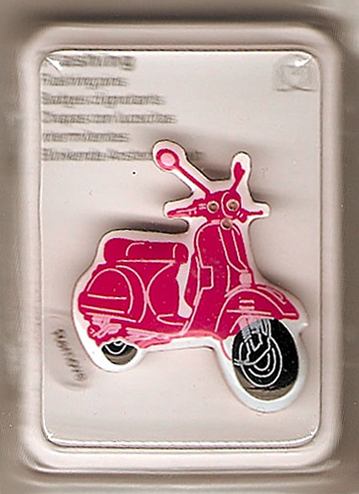 This entry was posted in Jewelry and tagged Jewelry, led brooch, pin, scooter, vespa by Tracy. Bookmark the permalink.